Local small businesses today are faced with significant challenges with marketing. Many small businesses are struggling to keep up in an increasing digital marketing environment, making their likely misconception of what real local marketing costs and budgets should actually be, a major factor in that struggle. Outsell’s Annual Advertising and Marketing Study completed this year indicates that digital represents nearly half of all marketing spending, rising over 12%. The fastest growing spend category for the digital marketing budget is mobile, which will outpace all other marketing categories in growth, up 38%. The research also pointed to creative and content capabilities to assist with cross-channel campaign efforts as significant areas where spending and attention will be placed. Additionally, marketers continue to invest mostly in their own websites, though search, mobile and social spending will make the biggest gains this year. 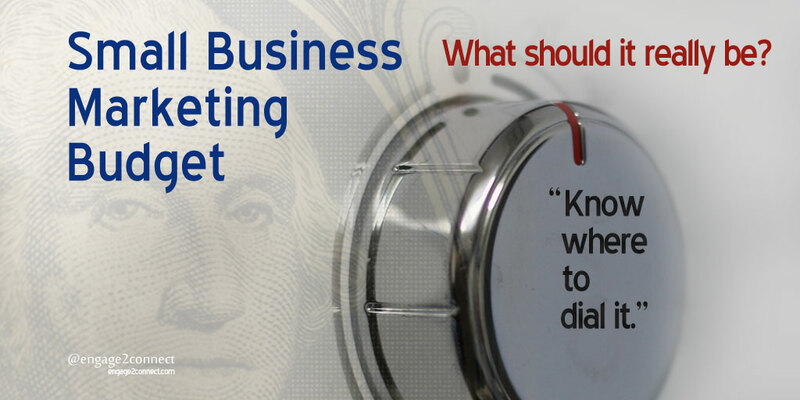 What Should A Marketing Budget Be For A Local Small Business? Out of all the research we did for this article, it was amazing to us that we could not find any posts or research that directly gave an answer to the question of what a small business marketing budget should be. Most of the content on the topic of small business marketing budget amount contained a lot of fluff and/or explanations of ways businesses calculate a budget dollar figure. None of the articles on local marketing budget dealt with the actual cost for small business marketing in today’s digital marketing and mobile marketing state. We intend to be more specific with local marketing budget costs and the resource requirements in this post. A minimum small business marketing budget or a minimum budget for local retail business marketing should really be no less than about $4,500 per month. That is a minimum cost for small business marketing and a realistic expectation that certainly goes up from there. Are you shocked? You shouldn’t be. Let’s get into some specifics that will help you understand what costs are involved for an effective local marketing effort and what you are up against. First off, let’s explain that small business digital marketing is not a single component, but rather several channels, components and functions that work together with a specific strategy and purpose. Your local digital marketing is only as good as its weakest component, so simply getting a really good social media presence or creating graphics for Instagram are not going to impact your local marketing results when you are not consistently creating blog content and/or your website is not portraying the proper messaging. Are you following us here? An SMB (small business) marketing budget will vary from one business to another, but the main requirements will be similar. To better understand the required time, resources and small business marketing expenses for making local marketing effective online, let’s outline just some of the required components and the time needed to do them properly, let alone get results. The most important point to understand with respect to your small business digital marketing is that there are two main things you should be paying for. 1- Time/Resources: The amount of time required to manage small business marketing on a daily, weekly and monthly basis is not small. From constant website development and management, to content creation, search and social media marketing, you are literally talking about 20-40+ hours per week on the low end. 2- Knowledge/Experience: One of the biggest local marketing challenges is a lack of knowledge and experience in small business marketing. Trial and error on a grand scale costs more than you think. Spending money where it will do no good, or improperly executing DIY digital marketing efforts with the hope of getting a return will cost a small businesses far more in missed opportunities, wasted money and time than most realize. It is important that the money you spend has experience and knowledge attached to it. Website – Do you know what it takes to develop a current small business website today? Do you realize the requirements of search engines surrounding both desktop and mobile website development? Do you understand effective messaging, user experience and design elements that make up an effective small business website? These are just a few of the things many small local business owners miss regarding their local website. If your small business has an existing website, but have not revamped it in the last couple of years, it is likely way out of date. If you have a local website currently and it is not driving online traffic, in store foot traffic or other real measurable results, we can assure you that there are likely some substantial issues with it. The time and resources required to revamp a current small business website is not at all small, neither is the knowledge and experience needed to make it effective for a small local company. In fact, our average existing website revamp for our clients takes from 80-120 hours (at least). This includes research, strategy, messaging, design, content creation, sales funnels, landing pages, list building and the list goes on before any development work is even started. Many times a small business website revamp involves much more time and effort than building a new website for a new small business. Add to this the continual daily, weekly and monthly changes that are required to maintain and more importantly improve the website, its performance and overall results and you can quickly add another 10-20 hours per week to the list. If small businesses understood the numerous moving parts related to new and revamped small business website development, it would likely make your head spin. Today’s digital marketing, website, search, social and content requirements are highly technical and change weekly. It’s one thing to have a small business website, it’s wholly another to have one that gets results. The gap between these two is quite massive. Social Media – How much time does it take to develop and manage small business social media marketing you ask? Though it definitely varies based on the industry, social media can be quite time-consuming when it is done correctly. All of our experience conducting small business social media marketing for our clients enables us to narrow to an actual minimum number. It takes a minimum of between 10 and 20 hours per week to properly manage small business social media marketing with results. Yes, we are serious and here’s just a few of the constant activities required to do it effectively. Community growth – Growing the size of your small business social follow across multiple social platforms. Expanding your reach of your target audience. Content posting/scheduling – Posting 100’s of shared content across multiple social platforms where your target audience spends their time. Not only do you have to post interesting, relevant content, you also have to first find that content at volumes that are required to get results on each of the social networks. Yes, that equates hundreds of posts each and every week. And if that wasn’t enough, you also have to post great content, stories and graphics about you and what you do. Engagement/outreach – Social media marketing is about conversations and building relationships with your customers and prospects. This requires outreach that opens conversations with your social following. You have to start conversations with them. Strategy – To be effective in social media marketing at the local level requires strategy, not just a strategy, but an effective strategy THAT gets results. A real social media strategy is fluid and requires continual measuring of activity and making adjustments to improve the net results. A lot more could be written about small business social media marketing but we think you are getting the idea of why it requires so much time and expertise to make local social media marketing achieve results. Organic Search – Managing search engine results for small business requires continual monitoring and adjustments. To rank highly on search is something that every small business must have as a priority. As the research we referenced earlier in our post outlines, most small businesses are investing in search engine optimization to improve local search results and it does require investment. In fact, we spend at least 10-15 hours per week monitoring, managing and improving our average small business clients’ search rankings. You see search engine optimization, SEO for a local business requires continual work to improve and even more work to stay on top, and we know what we are doing. Imagine trying to figure out search optimization and marketing or worse using someone who does not know what they are doing. Doing local search marketing right is imperative. Getting search marketing wrong can be disastrous to your small local business’s search results! What’s more, it can negatively impact your small business search results over a long period of time. Content Creation – In short, we spend approximately 5-10 hours per week creating content for our average small business client. This includes writing blog content, creating graphics and adding content to their existing or new web pages. Content creation, also referenced in the research above, is a required investment for every small business today. Even if your company isn’t creating content frequently, you need to know many of your competitors are and that effects you. Paid Marketing – Paid digital advertising has become a requirement for an effective digital marketing program for the local business. Paid marketing on Facebook, Twitter and search engines leverage all of the other elements of your local marketing efforts and provide additional traffic, sales and revenues that work together with the integrated marketing components discussed above. This is increasingly becoming a normal part of small business marketing online and is every bit as complex and technical as the other small business marketing components we have covered thus far. Paid marketing requires budget, time to manage and expertise to get it right. List Management – Another required component for small business marketing are lists. Whether you are doing email marketing or even direct mail marketing, building and maintaining customer and prospects lists are imperative. Not only do you need to build these lists and manage them, you also need to utilize them effectively through your digital marketing efforts. Email marketing is still one of the most effective marketing channels small businesses can use in conjunction with all of the other channels we have discussed. Doing list management effectively requires a lot of time and experience. Lastly, small business owners need to understand these marketing integration requirements for online marketing today. Using one or two digital marketing channels will no longer get the results it once did for the small local business. Utilizing multi-channel marketing platforms and tactics that integrate together is what works online. No matter where your target customer is, they should be able to find your local business and get value from that online presence. Understanding how to integrate messages, content and platforms into a unified local marketing effort is what separates successful small businesses from those that are struggling. Knowing that an extremely high percentage of small businesses fail, it is important to ensure that your local marketing efforts are inline with the minimum budget requirements and activities. Making your digital marketing effective by investing in the time, resources and talent required to make it a success should be your number one priority. Local businesses also need to be realistic on these requirements and come to terms with a real marketing budget required to make their small business marketing get results online. The minimum marketing budget we have outlined here is just that, a minimum level. Every business is different and many need much more than this minimum level.